When Windsor Boy’s School in England got a Makerbot Replicator 3D printer three years ago, its first contribution to the Design and Technology department was a ball of plastic spaghetti. Said ball was not exactly what Design and Technology teacher Phil Hall was expecting. However, it was, as he says, part of the process of learning to use 3D printers — especially in the beginning. It is something that teachers have to be prepared for. Now, plastic spaghetti is a rare occurrence, as the school’s students use 3D printing technology to design and build fully functioning speaker systems, phone docks, electric chargers and toy rockets. At Florida State University, Adam Santone and Rabieh Razzouk are part of the university’s FCR-STEM Center. Together with local teachers and MySTEMKits.com, they are creating educational resources and lesson plans that use 3D printing in connection with the K-12 curricula. “From introducing around 500 teachers to the program this summer, we will have between 20,000 and 40,000 students in Florida public schools engaged in using these resources. There is no doubt that the interest in 3D printing is there, and it has the potential to turn teachers into local educational supply factories,” Razzouk says. Teachers, experts, NGOs and industry insiders all agree that 3D printing has the potential to let teachers develop and rapid prototype teaching materials tailor-made for their lessons. It can free up funds from ever-shrinking school budgets, has the potential to disrupt educational industries, and, most importantly, help create better learning environments. “The ability to design, print, test and evaluate immediately would make for outstanding teaching and learning. This is the dream! However, we are not close to being there yet,” Phil Hall says. While much has been said, written and designed in order to engage learners in 3D printing, the ecosystem surrounding 3D printers and 3D design software leaves many teachers stranded — and there’s a very real risk printers will be left gathering dust. The question then is how to bridge the gap. If successful, 3D printing could be as native to upcoming generations as social media, mobile devices or the Internet and computers have been to those before them. The first challenge is to get 3D printers into classrooms, which is often easier said than done. Why? In part, because they sound like expensive technology. And that can be a hard sell. The words ‘school budget’ will make many schoolteachers immediately visualise either a razor or a sword. Schools across the world are often asked to cut spending, and in many places, the shrinking school budgets have led many teachers to use their own money to help stock classrooms. Commendable as it is, the approach is as long-term sustainable as trying to fix a crumbling dam with a roll of duct tape and some sticky-tack. It might not sound like the optimal situation for teachers to ask schools to invest in a 3D printer. But as it turns out, shrinking budgets are one of the best arguments going. “In some instances, 3D printing teaching materials are already cheaper than buying them. Take the well-known DNA models. They cost around $250 and you need a set per two, three students. 3D printing lets you do this cheaper and also allows for printing any missing pieces on the spot,” Rabieh Razzouk explains. Large-scale price comparisons between buying and 3D printing educational resources are difficult to find. However, a 2013 Michigan Tech study showed that 3D printing 20 household items instead of buying them led to an annual saving of between $300 and $2,000 a year. The falling price of 3D printing technology is essential for our company. Without it, we — as well as other small start-ups in this space — would not be able to create a viable business model. We want to create an open community based on an open source platform with a more traditional business model with a brick-and-mortar shop. We are still at the early stages of 3D printing. That said, children are incredibly good at absorbing information. If teachers and companies can find ways of engaging them with 3D printing, they will quickly become the first generation capable of exploring the technology’s full potential. In a school setting, the current speed of 3D printers would likely mean that they would struggle to produce all physical teaching materials. However, anything that can lower expenses would be welcomed with open arms by everyone from school boards to Washington. For example, California’s latest yearly budget for K-12 education was $76.6 billion. If 3D printers could help shave just 0.1 percent off that, it would equal $76.6 million in yearly savings. The price of 3D printers and individual prints is also falling rapidly, with many desktop printers available for between $1,000 and $2,000. Getting a printer into a school can also be a school project in its own right. Projects in Togo, Tanzania and Bolivia, for example, demonstrate it’s possible to build a fully functional 3D printer from e-waste for as little as $100 for parts and recycled plastic from PET bottles as filament. There is no doubt that there has been a growth in the use of 3D printing in schools and education. The spread really accelerated around 2013, when we saw the emergence of a new generation of low-cost printers, and one of the deciding factors for the spread of 3D printing in schools is definitely price. One model that seems to work well in some areas is bringing educators and local makerspaces together. And this is something that I think should be encouraged more often in communities. Teachers, interest organizations, industry insiders, NGOs and companies involved in education all highlight two the main challenges standing in the way of realising 3D printers’ full educational potential: the skillset of teachers and the lagging ecosystem surrounding the 3D printers. “3D printing is still a pretty skilled thing to be doing. There are definitely too few teachers who have the necessary skillset,” says Jon Fidler, lead designer of the Not-for-Profit NatureBytes. Software and downloading and printing 3D models are also problematic—there are too many different systems to choose from. Using the world of smartphones as an analogy, the lack of standardisation means teachers are not only asked to choose between Samsung, Nokia, HTC or Apple phones. They are asked to buy a phone and then learn how to program their new Android, IoS or Microsoft devices, often without much available time and little guidance. But even if you’re a 3D printing pro—there are simply not enough useful objects readily available to print, especially when it comes to teaching specific groups of learners. “Tactile graphic representations are incredibly helpful teaching materials for blind or visually impaired learners. 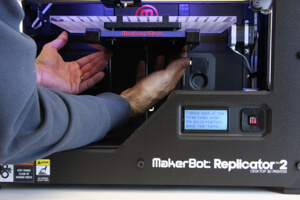 3D printing technology is a boon, but there are not any big libraries of graphic representations available at the moment,” according to Ike Presley, National Project Manager, American Foundation for the Blind. For us, the key to successful printing is to enable the students to successfully CAD model. This, in my opinion, is still a major hurdle in getting 3D printing into education. Too many schools that have 3D printers are still downloading generic files from sites such as Thingiverse. This is pointless. Skilled teachers need to be able to facilitate pupils in creating what they want to create, otherwise all of the opportunities of printing are lost. Learning these skills take time, which is something that schools need to set aside for the teacher involved in 3D printing. In many places, solutions to the challenges facing teachers are coming from the teachers themselves and their local communities. For example, some teachers and schools have reached out to local makers. This gives teachers a chance to try out the technology before deciding on its potential use in classrooms as well as a community of enthusiasts to rely on. The current problem is the printing speed, as well as a lack of education for teachers in how to get the best out of the 3D printers. We have helped create a peer-reviewed database of materials relevant to the K-12 curriculum. It currently holds 10,000 approved materials, and is testament to the fact that the best results for using 3D printing technology in educational settings invariably comes from multiple minds. The spread of 3D printing in classrooms is much like the spread of computers. It was relatively slow in the beginning, but is gathering pace. We are still at the ‘command prompt’ stage with 3D printers, which is one of the main hurdles for many teachers in using the technology. Educational videos can also come from teachers and local NGOs. He also sees university students with knowledge of CAD and 3D printing as a great, largely untapped resource for localized sparring with public school teachers over how to use technology in classrooms. Other areas offering challenges and opportunities include creating 3D printers, printing software and CAD software that is intuitive and easily accessible for teachers and students. “3D printing is still far from ‘just pushing a button to print.’ It is also still a low-volume process, which means that companies who produce and sell educational materials are in no danger of being outcompeted by start-ups and teachers themselves just yet,” says Yan Izo, CEO of Dreamfactory, an educational start-up using 3D printing to create educational materials. But What Happens When We Can Just Push a Button…? In the future, 3D printing will turn teachers into rapid prototyping factories, enabling a cheaper and infinitely more flexible teaching system. If a teaching material does not work, it can be changed or replaced. Teachers can work together to develop their own materials. They could, for example, print a new globe whenever borders shift—no more waiting to save up funds for a new map. For learners, it means an early introduction to a powerful new technology and the chance to make something from nothing—to experience the creative process from start to finish. Countless studies show how this project-based style of learning helps students retain what they learn. We use 3D printing to let learners build a motion-sensitive camera. The finished camera is then placed in their local area where it collects data about the wildlife, which can be shared with other local communities, as well as scientists. We think that it is an example of how 3D printing lets students follow a project past the production phase. Usually, you build it, they grade it and then you forget about it, to put it a bit bluntly. For me, personally, I experienced this in a woodworking class when I was around 12. The result of my project was a collapsible beach chair made of wood, which lasted about 10 years (although it was mostly used by my parents as a place to put clothes that needed ironing). If push came to shove, I am pretty certain I could build one today. Consider William Kamkwamba, the Malawian inventor, who as a teenager built a fully functioning windmill capable of powering electrical appliances from scrap. Imagine what others like him will be able to achieve with 3D printers—a generation that will grow up accustomed to their ideas moving fluidly between the digital and physical, whose imaginations are made manifest with the push of a button. Their ideas could immediately be translated into physical improvements of the world around them. We aren’t there yet. But with continued improvement, it’s where we’re headed.